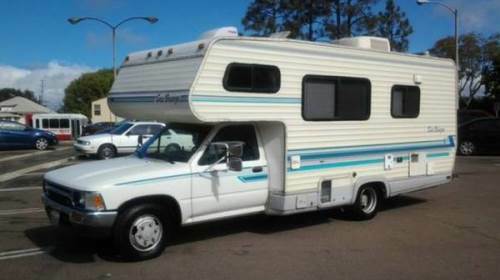 Yes, this is that Toyota RV you have been looking for! It is rare and unique especially because it is NOT a project! Just the opposite — everything has been carefully gone over to be as nice as possible. 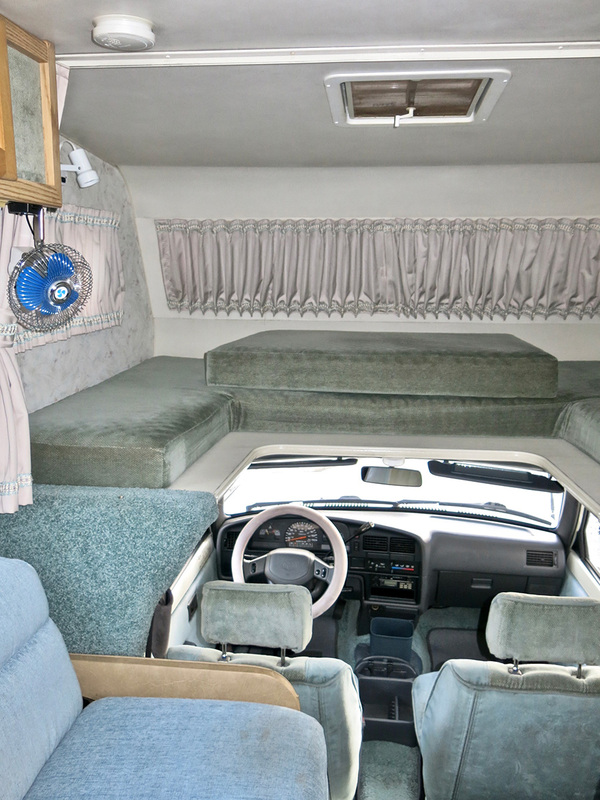 Restoring Toyota RVs is our hobby. 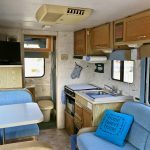 My assistants and I have spent multiple hours in the last seven months intentionally refurbishing this coach to be optimally usable for the next owners. We are experienced in what we are doing and we take pride in our work. There is a lot of satisfaction from putting one back on the road as it was meant to be with everything working again as perfectly as we can make it. 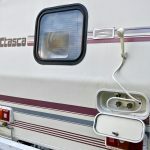 And just to be sure, we gave it a “road test” when my husband and I personally camped it for a week on a recent trip to Arizona. “Way above average” aptly describes this coach. The reasons will become obvious when you read its many features and upgrades. 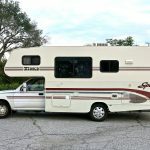 Most Toyota RVs that come up for sale need a fair amount of time and attention, and probably a good amount of money to make them comfortable and trouble-free again. Here now instead, is one that is ready to take camping right away. What you will read about is almost 160 different items and upgrades that the new owner WON’T have to deal with because we have fixed or improved or added them already. 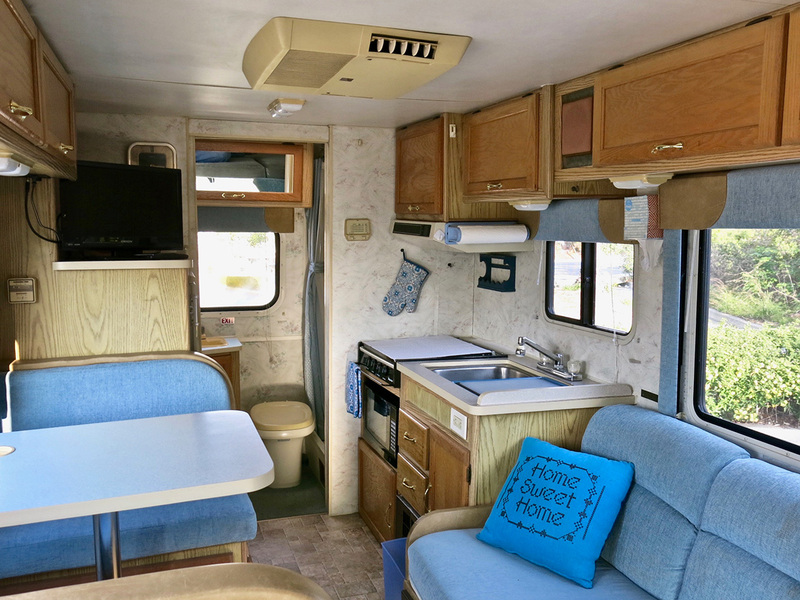 First of all, this model is a Winnebago Itasca Spirit, which it is considered to be the best built of any brand of Toyota RV overall, but nicely-restored ones like this are rather hard to find. Secondly, it has a V-6 engine (not a 4 cylinder) so you have more adequate power for climbing hills, and you have the ability to tow a moderate load. Interstate speeds of 65 mph are easy to maintain. The ride in the cab is much quieter and the seats more comfortable than earlier models. 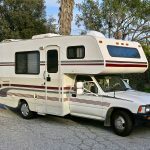 Mini RVs with a Toyota chassis are increasingly sought after because of their longevity and great gas mileage, especially compared to any other RVs of the same size and price. This one with automatic transmission has been documented to get over 16 miles per gallon; that’s about twice the mpg of an American motor RV. Thirdly, all tires are reasonably new (proper load range D) — Uniroyals, installed on rears in April 2018 and Hankook Vantras, installed on the fronts in July 2017. 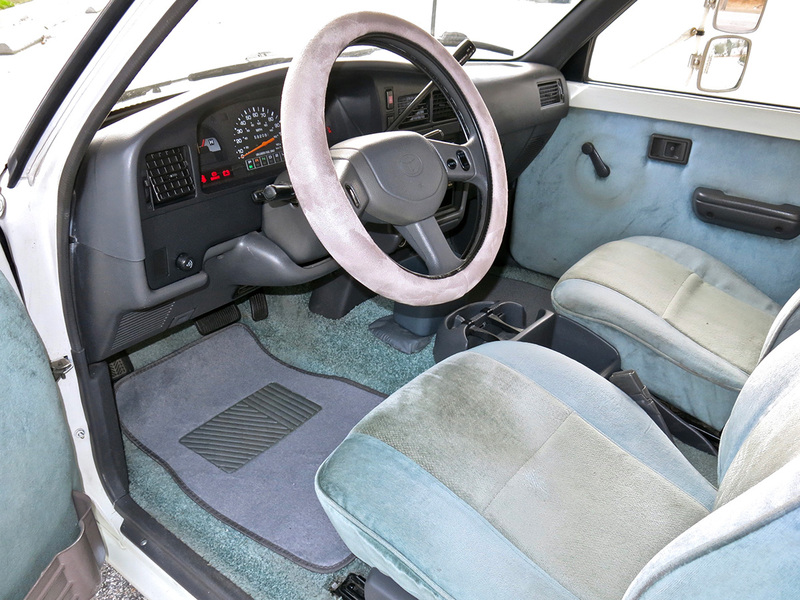 This vehicle has the full-floating one-ton rear axle and six-lug wheels throughout. Chrome-look wheel covers are installed on the rear wheels. 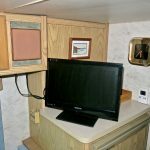 The Air Springs installed in the rear provide a more comfortable ride for passengers, and for leveling the coach somewhat while camping. 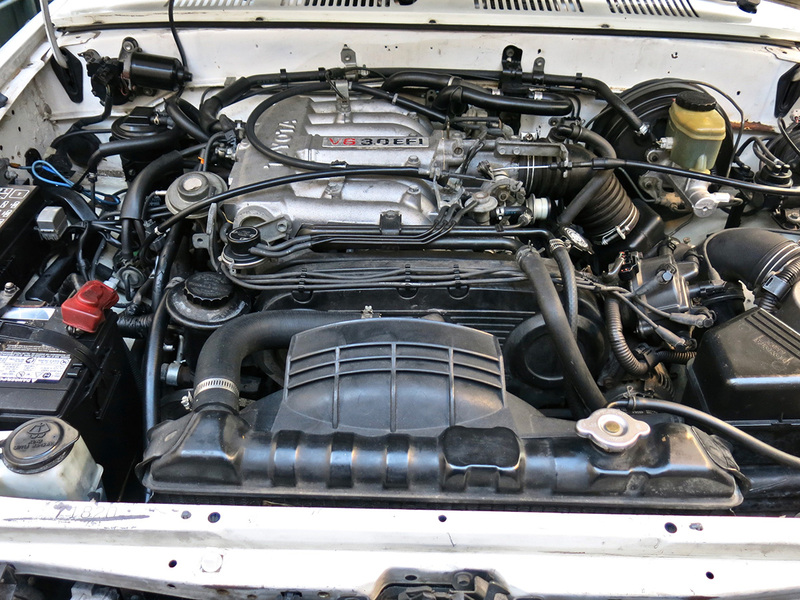 Additionally, this engine has quite low miles on it — only 46,300. This is a much newer engine than the original. 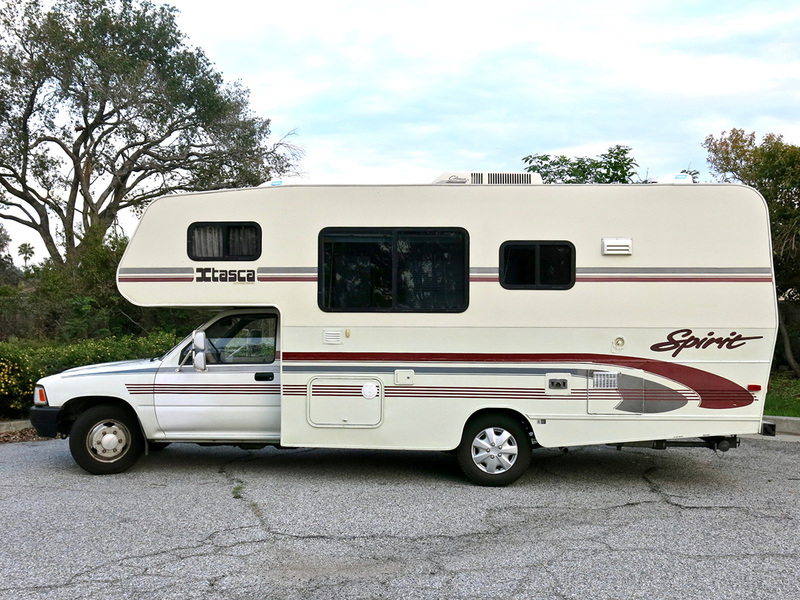 The chassis overall has 159,200 which is not that much above average for a Toyota RV. 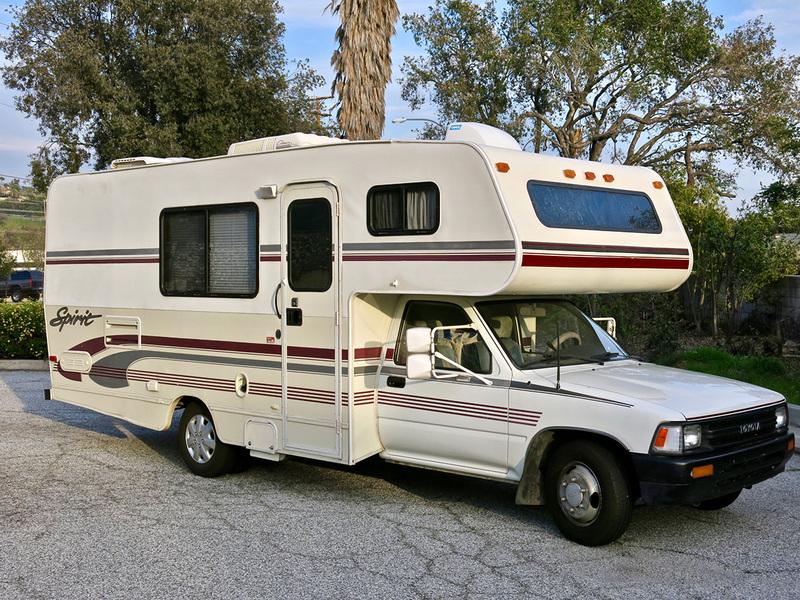 We personally know of several well-maintained Toyota Winnebago RVs like this with over 200,000 miles that are still on the road and being enjoyed as much as ever. 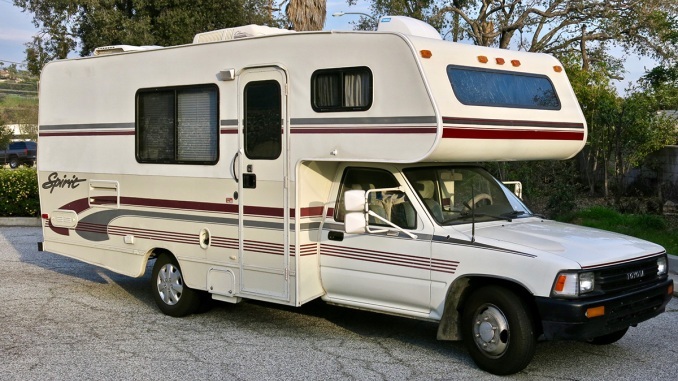 And just so you know, this 1993 model is the last year that any motorhomes were built on a Toyota chassis = as new as you can get. 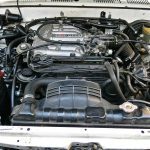 It also has had transmission service, radiator service, new starter, new steering components and stabilizer, new rear differential, new front brakes. 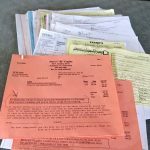 Service records dating back to 2007 confirm that there has been ongoing attention to maintaining all components of the engine and drive train in better than average condition. 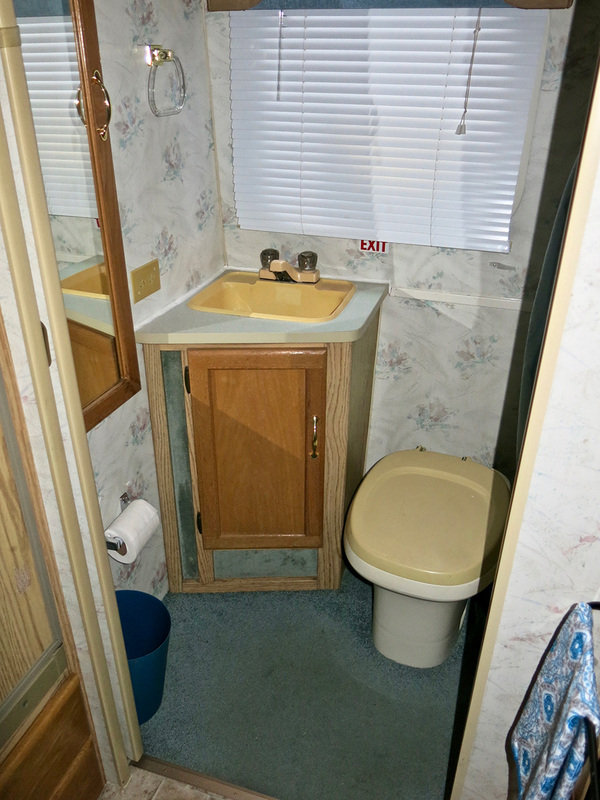 The exterior of the RV is flat-sided fiberglass, which is considered more desirable than corrugated siding. The surface has now been polished and detailed, and the exterior stripes which were faded have been replaced with new where needed. The outside mirrors have been refurbished to look fresh. 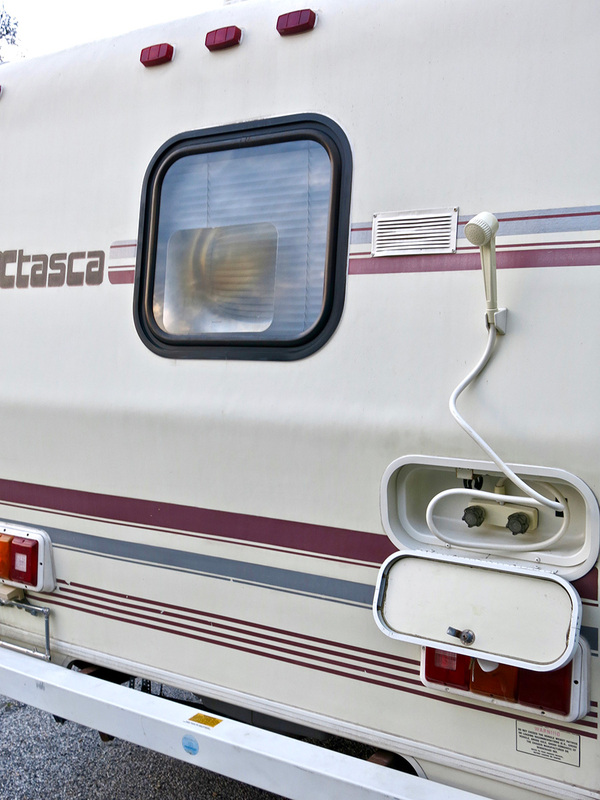 If you didn’t know, finding a nice-looking exterior on a Toyota RV is a hard thing to come by. — Second shower outside on the rear, with both hot and cold water for use at the beach, etc. INTERIOR REFURBISHING: We have taken great care to be sure that the interior of this coach is in presentable condition in all aspects. — New 12-volt socket splitter with USB port for cells phone, etc. 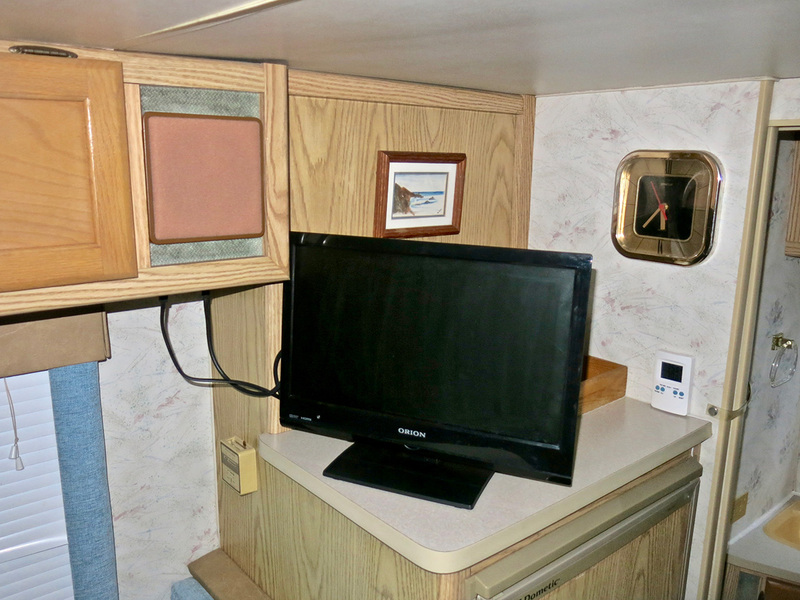 After months of meticulous attention to details, this coach is now ready to drive and comfortably camp in again. 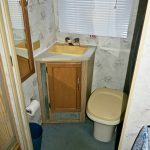 What you will be getting with this RV is the peace of mind that the multiple issues that regularly come with used Toyota RVs have now already been taken care of for you. 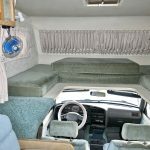 The price of $19,950 is in keeping with the time it has taken us to restore this RV to be in the way-above-average condition that it is. 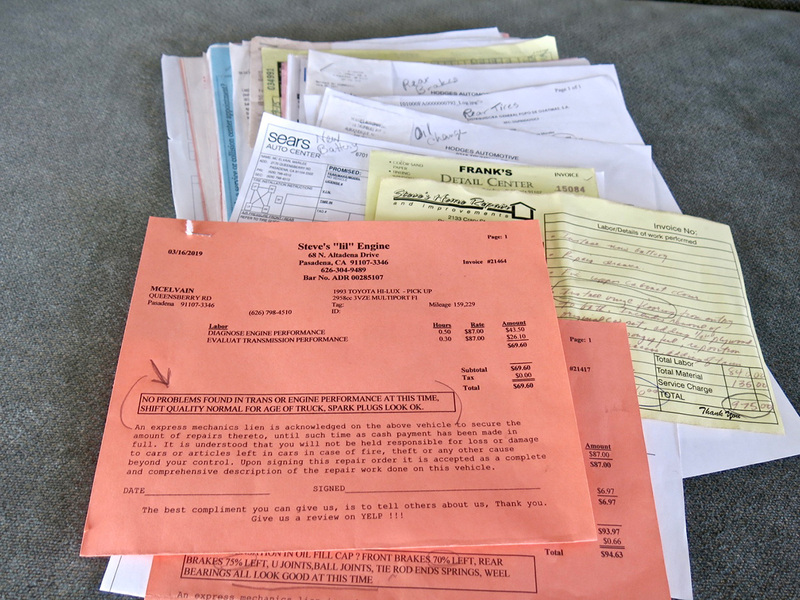 The fact that we have already spent so many thousands of dollars on it means that you shouldn’t need much budget beyond the purchase price, as you would for most others that are out there for sale. 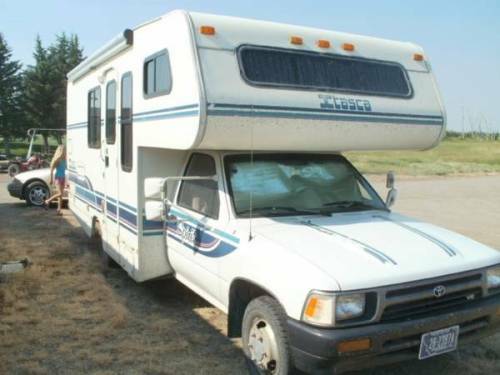 If you are seriously interested in having this be your new Toyota RV but are not in the area, a modest deposit can hold it for you. (Deposit applies to the purchase price of course.) It is located in Pasadena, California. Transportation from Los Angeles area airports can be arranged for buyers from out of the area. Please call for more info and to have your questions answered, 626-798-4566. Leave a message with our voicemail and we will call you back soon. Phone calls will be given priority over email replies. 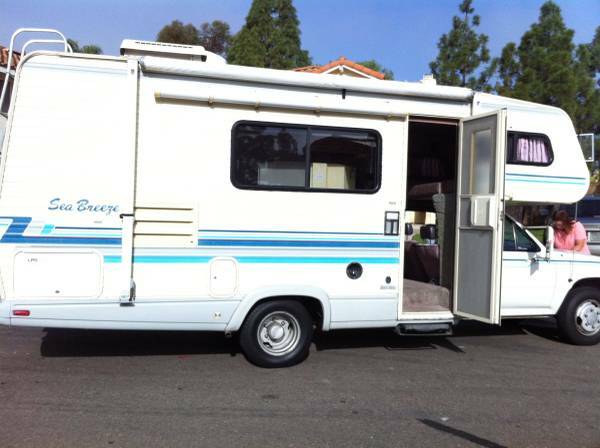 The right next owner for this Toyota Itasca RV is someone who knows a real gem when they see one.